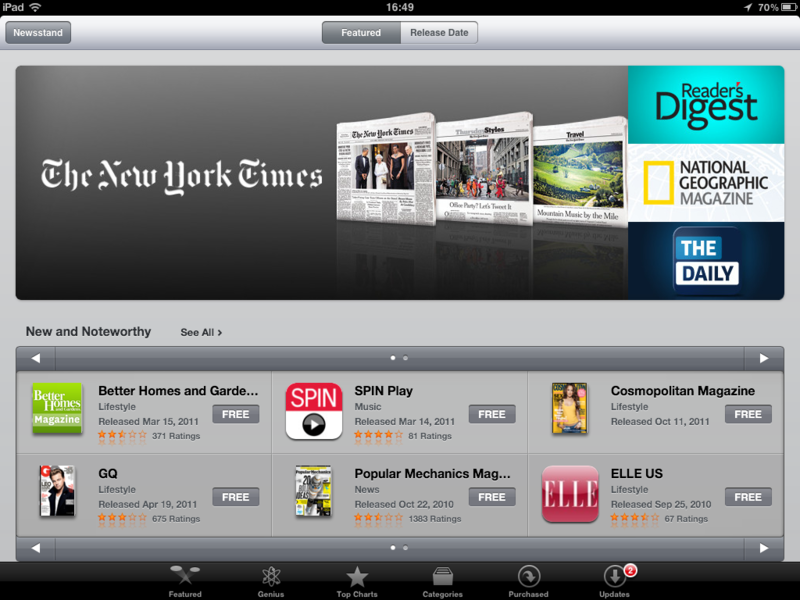 A dedicated Store button has begun appearing in the Newsstand app to some iPad owners with iOS 5 GM installed. Clicking the button brings up a new iTunes section listing all digital magazines that have been updated for Newsstand. This is a built-in store in much the same way the iBookstore is integrated right within the app. You can filter the list by Featured or Release Date. The initial selection included about 120 digital publications optimized for Newsstand at press time. 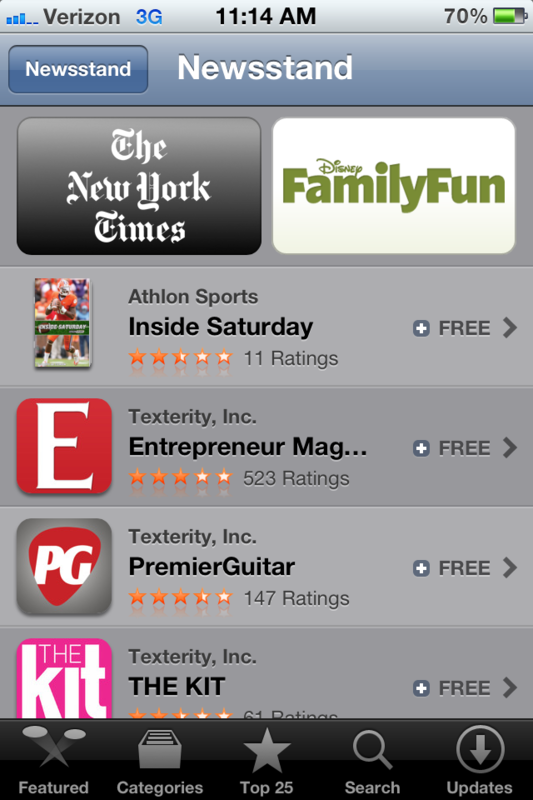 Apple yesterday began populating the iOS 5 Newsstand app with first digital magazines. 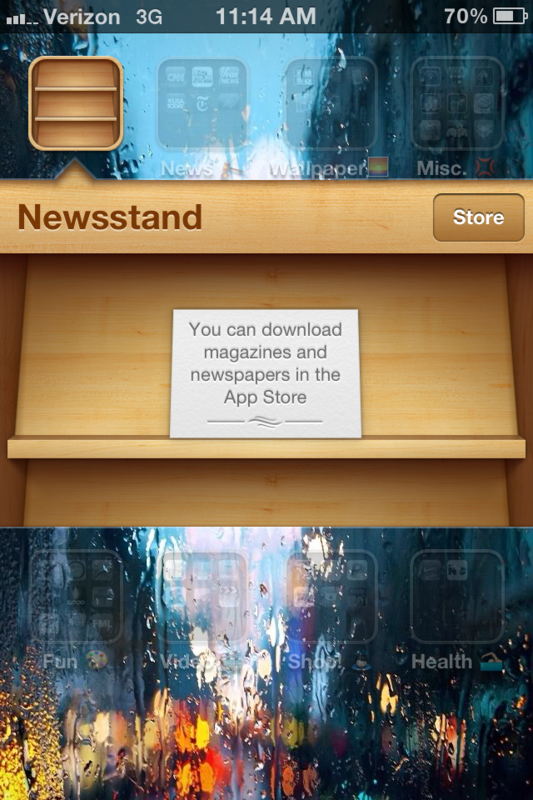 Newsstand is a special folder on your iOS 5 device sporting a nice-looking wooden shelf that keeps all your digital publications in one place. Note that publishers are required to update their digital publications with Newsstand functionality. Otherwise, “old” digital publications will still populate your home screen and your iPad won’t be able to automatically download new issues for you. Think of Newsstand as a smart filter on your device that automatically picks up any compatible digital publication on your home screen and moves it inside the folder. Also worth remembering, Newsstand-compatible publications will ask for your permission to send you notifications and download new issues automatically, when on Wi-Fi networks. You can manage Newsstand content delivery settings on a per-app basis in the Store section of the Settings app. The Store section was accessible only via the Newsstand app interface and wasn’t live in desktop iTunes at post time. Also, we couldn’t find a direct link to the Newsstand Store in the App Store/iTunes mobile apps, but we’re expecting it live soon. If you don’t see the Store button yet in the Newsstand app, try restarting your iPad. Let us know in the comments. iPhone screenshots courtesy of reader Ian A. Click for larger.